The new and improved Heater Deuce-75 Two Wheel Curveball Pitching Machine is, by far, the most economical two wheel pitching machine you will find on the market. 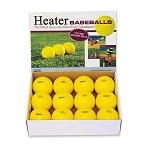 Heater Sports removed this machine from its lineup for several years in order to work out a few bugs and the new version is far more durable and accurate than the original was. Practice hitting fastballs, curves and a variety of other breaking balls with the Heater Deuce-75 2 Wheel Pitching Machine. 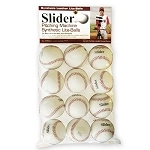 This pitching machine includes an automatic ball feeder which holds 12 baseballs so that you can practice whenever you want, without needing another person. Once the automatic feeder is on, balls are pitched every 10 seconds. The Deuce-75 2 Wheel Pitching Machine allows you to adjust two wheels independently for duel speed control to throw a variety of pitches up to 75 miles per hour! The innovative pivot head design means you can simulate throws from left or right handed pitchers as well as throw 3/4 breaking balls. Along with the pivot head design and variable speed control, this pitching machine has an adjustable pitch height, so you can customize pitches to work on trouble hitting areas. The quality design of the Heater Deuce-75 Two Wheel Pitching Machine makes it durable and adaptable. This pitching machine's legs are built of tubular steel and are made to last. Encased in a steel housing, these fully enclosed wheel means maximum safety for you and those around you. It can plug into an outlet using the included A/C adapter and mounted on the optional PowerAlley batting cage or Xtender Home batting cages for long term practice right in your own backyard. The Deuce 2 Wheel Pitching Machine includes a 30-day money-back guarantee and a 1 year limited warranty to ensure your satisfaction. PLEASE NOTE: Although the Deuce-75 2 Wheel pitching machine can throw regulation baseballs, it is highly recommended that you use Heater Sports approved pitching machine balls. They fly straighter, last longer and do far less damage to pitching machine wheels than real baseballs do. 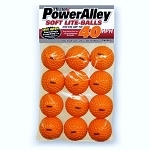 A list of balls for the Heater Deuce pitching machine is provided in the Approved Balls tab, above. I kind of crossed my fingers when I bought this, seeing that it was so much cheaper than the other two wheel curveball pitching machines. Got it set up in a barn right now cause it's too cold outside. So far, so good. Throws a wide variety of pitches and is pretty accurate. Seems well built and I hope it lasts awhile. Q: Can machine be used by catcher for blocking drills? A: The Heater Deuce pitching machine can definitely be used for all kinds of defensive drills, including blocking drills with a catcher. The machine head can be rotated left-right and up-down. The ability to throw various different breaking pitches makes it even better for simulating the spins and hops balls take from errant pitches. Q: Can this throw pop-ups for defensive drills? A: Yes, the Heater Deuce can throw pop-ups. Like most Heater Sports pitching machines, you can even remove a section of the back leg, causing an even steeper angle of the pitching machine head, and get it to throw even higher ones. To ensure your satisfaction, the Heater Deuce Curveball Pitching Machine includes a 30 Day Money Back Guarantee. Heater Deuce pitching machines are also backed by a Full 1 Year Warranty that includes repair, replacement and labor. No matter where you order a Heater Deuce-75 Pitching Machine from, NOBODY actually stocks them; they all ship directly from the manufacturer's warehouse located in St. George, Utah. Therefore, the shipping time frame is exactly the same no matter what website you order from (we hope that it is this one!). 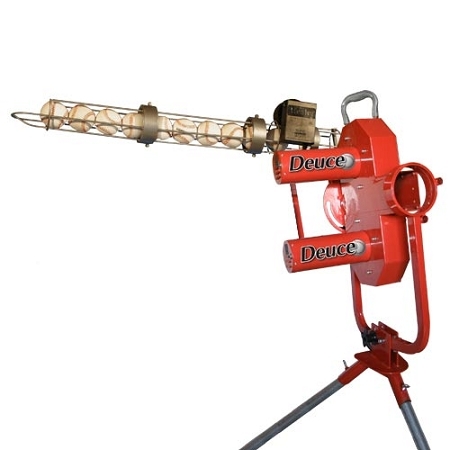 Heater Deuce-75 2 Wheel Pitching Machines typically take 2-4 business days to ship from the time you place your order. They ship via Federal Express (FedEx) Ground and could take anywhere from a day or two to a week to get to you AFTER being shipped, depending on your proximity to their warehouse. We will notify you of your tracking number the moment we receive it from the manufacturer's warehouse. 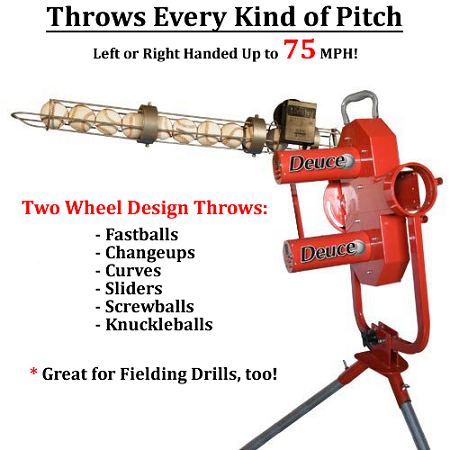 Click here to download an easy to read, printable PDF of the Heater Deuce-75 Two Wheel Curveball Pitching Machine Owner's Manual.